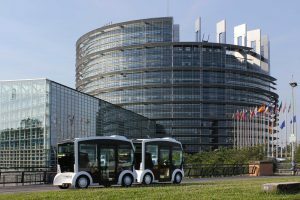 As part of the EVAPS autonomous shuttle project to serve the Saclay plateau, the calendar for commissioning the i-Cristal shuttles has been revealed. LOHR’s Cristal is now in the industrialisation phase and it will be possible to start placing orders at the end of 2018. The vehicle is expected to be approved by then. 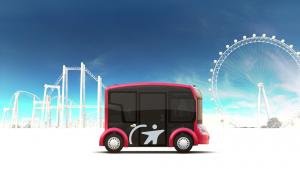 A third player will soon be active on the autonomous shuttle market, or rather two partners. 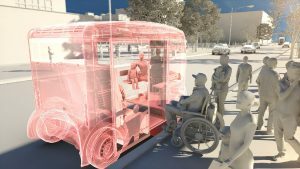 These are the industrialist LOHR, and the operator Transdev, who are developing i-Cristal, a driverless vehicle able to carry 16 people. 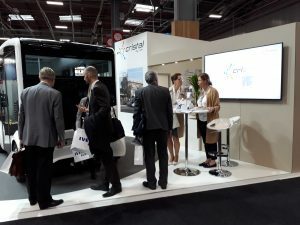 Thank you to the Transports Publics 2018 exhibition for this 8th edition of the European Mobility Exhibition. The industrial group LOHR is present at the new edition of the Transports Publics European Mobility Exhibition from 12th to 14th June 2018. 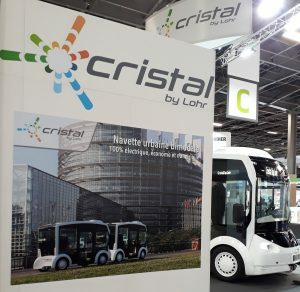 Patricia Villoslada,Vice President Autonomous Transport Systems Department at Transdev, answers questions about the development of i-Cristal, an autonomous shuttle designed in partnership with Lohr Industrie. 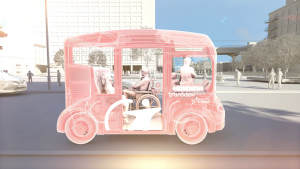 Spiegel Online refers to Cristal, a specific coupling system allowing several vehicles to be coupled together, thus creating a shuttle. 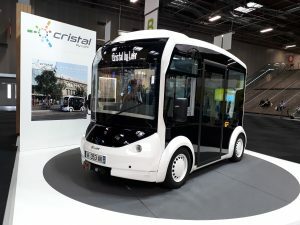 Cristal can be used as public transport or as individual self-service vehicles. The world leader in car transporter vehicles and a specialist in road-rail combined transport, this flagship industrial company based in Hangenbieten in Alsace is now taking up the challenge of sustainable urban mobility. 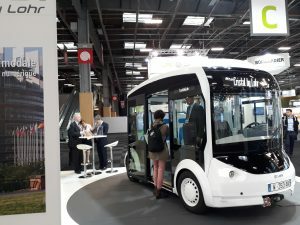 At the Smart City Expo World Congress currently taking place in Barcelona, there is a lot of talk about autonomous shuttles, connected parking and even air quality. 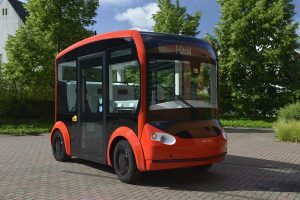 Lohr and Transdev announce their autonomous shuttle for Autumn 2018. 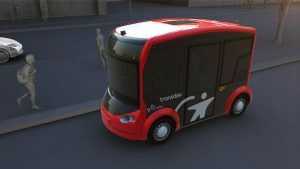 At the Smart City Expo World Congress in Barcelona, Transdev and Lohr announced the launch of their future autonomous shuttle for Autumn 2018. The partnership between Transdev and Lohr was the opportunity for the two companies to pool their expertise.